Off-site shredding is usually preferred by our clients when our mobile shred truck can’t easily reach their location or they don’t want the shredding to be done at their site. In these cases, Shred Wise will go to their place of business or residence; pick up their bins, bags, or boxes of paper; transport their paper securely to our facility in Orange; and shred all of their documents in one of our highly secure mobile shred trucks. All of their shredded papers will be diluted with hundreds of pounds of other shredded paper and then taken to a recycling plant to be made into new paper products. Because we are acutely aware that our clients’ documents must be kept safe and strictly confidential at all times, we take exhaustive measures to ensure that we are always following the industry’s best practices for document destruction. This includes carefully selecting and screening our employees; keeping documents securely locked until they are about to be emptied into the shredder; using one of the fastest and most-automated shred trucks on the market today; and inviting our clients to witness the document destruction process in person, either curbside or via our onboard shred cam. At the conclusion of each off-site shredding job, we immediately issue a Certificate of Destruction. 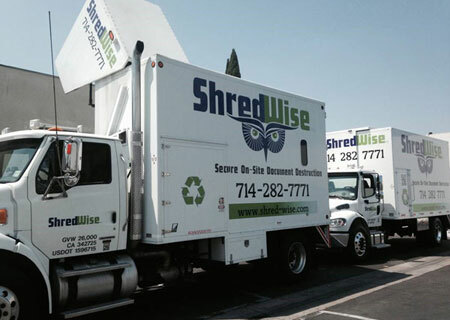 Shred Wise is a family-owned and -operated shredding business in Orange County. We are licensed, bonded, and insured; and comply with NAID (National Association for Information Destruction) standards. Call us today at (714) 282-7771 for a free quote. In most cases, we can provide a quote over the phone if you can take a picture of the shredding job to be done which will help Shred Wise analyze the scope of the job and give you a more accurate quote. Our rates are always competitive, and we offer volume discounts. Our off-site shredding service is available Monday through Friday, from 7am to 5:30pm, anywhere in Orange County. When necessary, off-site shredding can often be scheduled for same-day or next-day service.